The Global Unique Device Identification Database (GUDID) contains key device identification information submitted to the FDA about medical devices that have Unique Device Identifiers (UDI). The FDA is establishing the unique device identification system to adequately identify devices sold in the U.S.- from manufacturing through distribution to patient use. You can use AccessGUDID to search for specific medical devices or download all the GUDID data at once. We anticipate the release of additional web services for testing by the end of 2015. Please see the API Documentation for more information. Medical devices cover a wide range of products - implants, CT scanners, surgical instruments, contact lenses, wheelchairs, and blood glucose tests, to name a few. Unlike drugs, many medical devices currently do not have a unique identifier that clearly distinguishes one product from another. But this is changing. The UDI system will provide a consistent and standard way to identify medical devices throughout their distribution and use by health care providers and patients. Most devices will be required to have a UDI on their label and packaging, and for certain devices, on the product itself. Device companies must also submit certain information about these devices to the GUDID (pronounced "Good ID"). Please note: The GUDID does not collect or contain any information about patients or anyone who uses a device. UDIs will be phased in over several years, starting with the highest risk devices, such as heart valves and pacemakers. Because of this, records for only a fraction of devices currently in use have been submitted to GUDID. For more information about UDI and GUDID, see below. The National Library of Medicine (NLM), in collaboration with the FDA, has created the AccessGUDID portal to make device identification information in the GUDID available for everyone, including patients, caregivers, health care providers, hospitals, and industry. In our beta release of AccessGUDID, basic search and download functions are available. We plan to develop advanced search and web service capability in the future. The device information available on AccessGUDID is the most recent data submitted to the FDA that has completed the "grace period" after initial publication. (The grace period is the time during which device companies may make significant edits to their information; once the grace period is completed, only limited editing of device information is possible.) GUDID data is updated every business day, so the most up to date information can be searched or downloaded from this site. Device Identifier (DI) - A unique numeric or alphanumeric code specific to a device version or model. For a Human Cell, Tissue or Cellular or Tissue-Based Product (HCT/P) regulated as a device, the distinct identification code that allows the manufacturer to associate the HCT/P to the donor. Therefore, UDI = DI + PI. UDIs are created based on international standards for unique identification. Private organizations, called "Issuing Agencies", are accredited by the FDA to operate a system for the issuance of UDIs based on these standards. A unique device identifier (UDI) on a device label appears in both plain text and in machine-readable format. Below is an example of a unique device identifier (UDI) from GS1, one of the FDA-accredited issuing agencies. It uses a 1D barcode for its machine-readable format. In GS1's system, the numbers in the parentheses indicate the different parts of the UDI. The Global Unique Device Identification Database (GUDID - pronounced "Good ID") is a database administered by the FDA as part of the UDI system. The GUDID contains device identification information submitted by device companies to the FDA. The GUDID contains ONLY the Device Identifier (DI), which serves as the primary key to obtain information in the database. Production Identifiers (PI) are not submitted to or stored in the GUDID, but GUDID data indicates which PIs are on the device label. 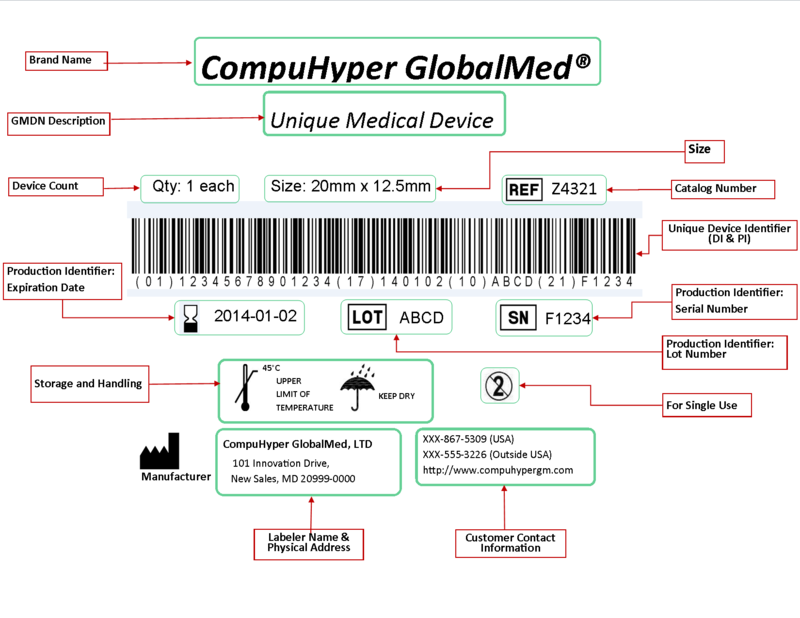 Many data elements in the GUDID correspond to information on the medical device label. 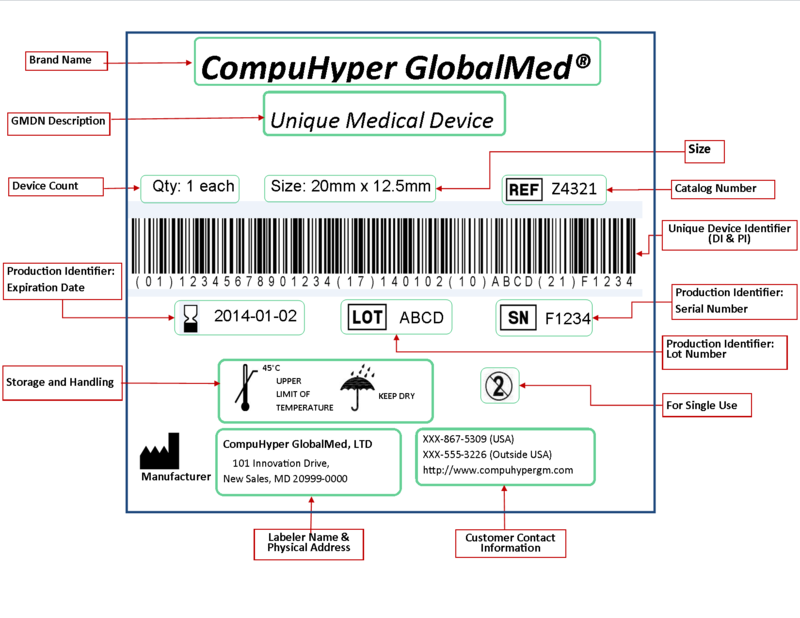 The figure below shows a fictitious medical device label and identifies the GUDID data elements that appear on the label. Please refer to the FDA UDI website for more information about GUDID data elements.